James McArthur Washington was originally a 5th round pick of the then Los Angeles Rams in 1988 out of UCLA. He’d play two seasons for the team as a backup, suiting up in 25 games and making one pick. 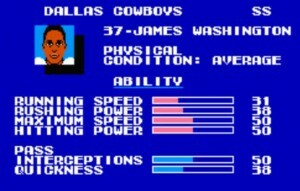 In 1990 Washington would sign Plan B with the Dallas Cowboys. I’d swear that he was the Dallas Cowboy who first wore the dew rag on the team- frequently sporting a black one across his head that made him look like a ninja samurai headhunting safety. 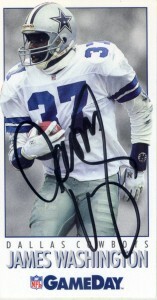 Playing for the Cowboys he would enjoy his greatest success allowed to roam the secondary as a starter at strong safety and occasionally at free safety, pulling in a career high 113 tackles in 1991 and 5 interceptions in 1994. SuperBowl XXVIII (1993) would be his finest hour where he’d make an interception, recover a fumble for a touchdown and make a team high 11 tackles. Even though Washington was considered for the MVP honor, he eventually lost out to Emmitt Smith for the honor. In 1995 he’d sign as a free agent with the rival Redskins, where he’d start 12 games making 2 interceptions before he retired after 7 seasons. James works for Fox Sports Radio and net, founded and works with Shelter 37, Inc., and was named in 2010 as the Assistant Director of Alumni Giving at UCLA.